rn Reading the Twilight series I often wondered about what life was like for the Cullens before Bella and Forks. Though in the series we do get some back stories, overall it isn't very well explored. So this is result of those wonderings - a collection of pre-twilight stories and one-shots. I'm just trying to tell a few of the stories behind the story we all love. 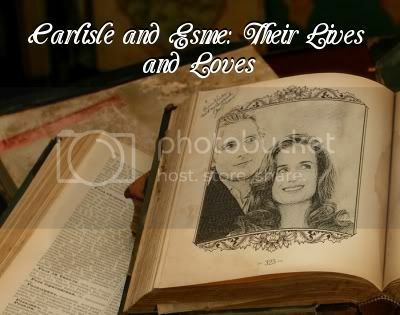 This is the story of the lives of Carlisle and Esme. Starting with Carlisle's human life and lonely vampire beginnings, then Esme's human life, before looking at how they first met, found each other again, fell in love, married, and built themselves a family. This story is told in five parts. Winner of a Hopeless Romantic Award. "What was I thinking? What was I doing? I knew what my next course of action would be, what it had to be, and it was horrifying. A tiny portion of sanity fought to stop me. But the rest of my mind was no longer in my control. A few more moments and I came upon a small tent with a smoldering fire out front, two adults sleeping inside. Nobody else was in sight or hearing. It all happened very quickly. In less than a second I was the only one in the tent breathing. The tiny portion of sanity in the corner of my mind was nowhere near strong enough to stop me from quenching my thirst. It wasn't until after I was finished – my scorching need faded but not completely satisfied – that I fully comprehended what I had done. Though I still didn't know who I was, I now knew what I was. I felt sick at the thought." Full Moon Rising follows Alice as her human life ends and her vampire life begins. Each chapter gives a new glimpse into her history, from her family life with her parents and sister, through the dark years at an insane asylum, to finally meeting Jasper and travelling with him to meet the Cullens. Kept as canon and historically accurate as humanly possible. Rated R for sexual content, dark themes, and violence. Having escaped his Hellish life with Maria and now having left the companionship of Peter and Charlotte, Jasper Whitlock thinks he's damned to care out the rest of his existence all alone for eternity. After all, no other vampires care about killing humans, right? So who on Earth would want to be be stuck with him? A look into the minds of Carlisle and Esme during Edward's rebellious phase. How did their marriage cope with the strain of a missing son? And what happened when he finally came home? Esme Platt Evenson chose to end her own life after losing her son. Now stuck in what she believes to be Hell (what else would explain the fire? ), she reflects on the loss of her son and an earlier loss as well. But when she wakes to find an angel, she realises that maybe this isn't Hell after all. Whenever I slip up, my Love is always there to comfort me. Even when I let our new family down. Disclaimer: I do not own Twilight, and its characters, or plot. The characters, books, and plot are property of Stephenie Meyer. I make no money from writing this. the amazing FrozenSoldier made this banner for me.